In the late 60s, Joseph Phelps was running one of the largest construction companies in the U.S. when he won the bid to build Souverain Winery (now Rutherford Hill) located a few miles outside of St. Helena. Enamored with the beautiful Napa Valley and contemplating a career change, in 1973 he bought the 600-acre Connolly cattle ranch in Spring Valley, and began planting vineyards. The winery was completed in 1974 and that same year the first Syrah was made, the first grapes were crushed at the new facility and the first Insignia was produced. It was a period of unparalleled activity, creativity, ingenuity, entrepreneurship and risk-taking and it put Joe Phelps on the map of top Napa Valley wine producers. Insignia is the first proprietary Bordeaux-style blend produced in California. Each vintage is comprised of the best grapes from Joseph Phelps Vineyards, first from both grower and estate fruit, and beginning with the 2004 vintage, from entirely estate-grown fruit sources. 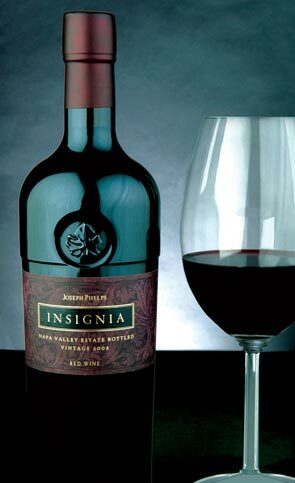 Insignia is a Cabernet Sauvignon based wine crafted from six of the Joseph Phelps estate vineyards: Spring Valley Ranch Vineyard in St. Helena, Banca Dorada Vineyard on the Rutherford Bench, Las Rocas and Barboza Vineyards in the Stags Leap District, Yountville Vineyard in the Oak Knoll District and Suscol Vineyard in South Napa Valley.